As the days of spring grow longer and the valleys turn green, east coast skiers are left with two options: ski the man-made glacier on Superstar at Killington, or head to the high alpine terrain of the Presidential Range in New Hampshire. 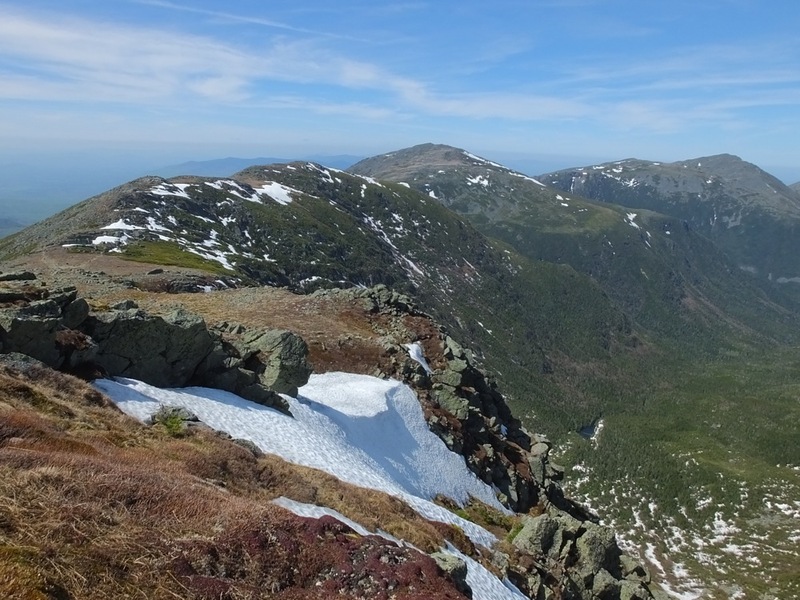 My plan was to backpack into the Great Gulf, a huge cirque cut by glaciers on the northeast side of Mount Washington. From there I’d set up a base camp which would allow me to access the snow-filled gullies spilling off the flank of the northeast’s highest peak. I shouldered a heavy pack, loaded with camping and ski gear. I chose a campsite about three miles in, with a spectacular view into the gulf, and the rushing waters of the Peabody River below. That night I slept to the soothing sounds of thunderstorms, knowing that they would give the gullies a nice overnight grooming. 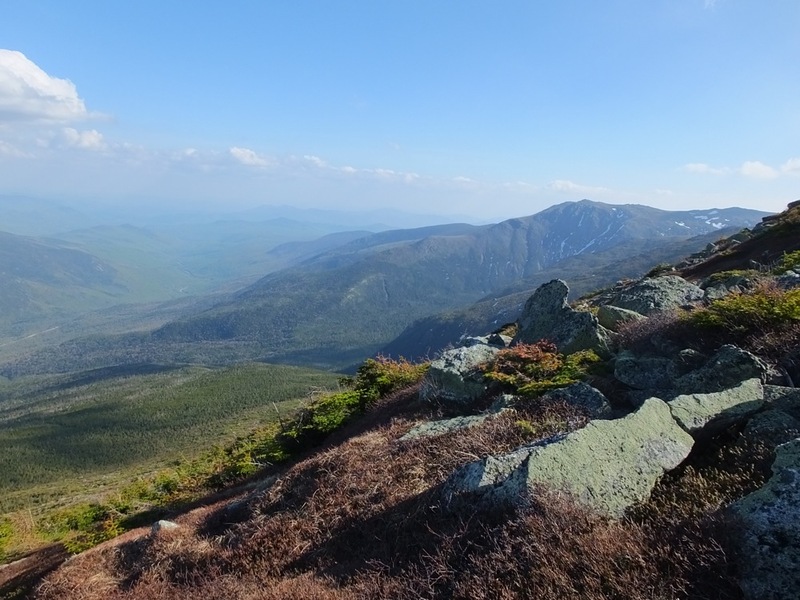 The next morning I got an early start for the four-mile hike to Spaulding Lake, where the various gullies on Mount Washington and Mount Clay converge. A thick mist obscured the mountain peaks above, creating an aura of mystery. 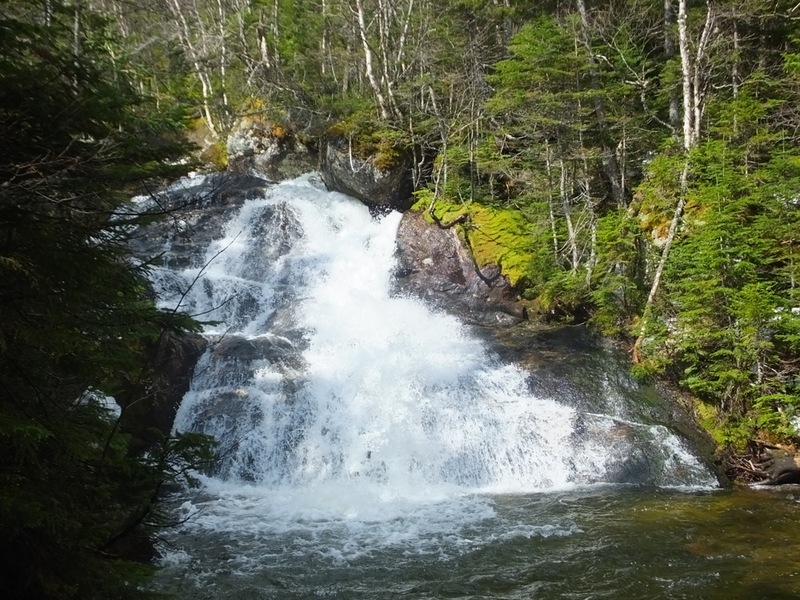 The first two miles went smoothly, with a multitude of cascades and rapids fed by the rapidly melting snowpack. The third mile was among the most difficult I have ever hiked, a maelstrom of undermined snow, challenging stream crossings, and mud. Finally the snow became consistent enough to don my skis, and I enjoyed a comparatively easy last mile of skinning up to Spaulding Lake. Here I encountered many others who drove the auto road to the summit, and hiked the short distance to the rim of the gulf. The obvious choice for skiers was Airplane Gully, offering about 1000 vertical feet of high quality spring skiing. Most other gullies were either totally burnt out or discontinuous. As I hiked up the boot-ladder into the mist the anticipation was high as I watched skiers descend, hooting and hollering. 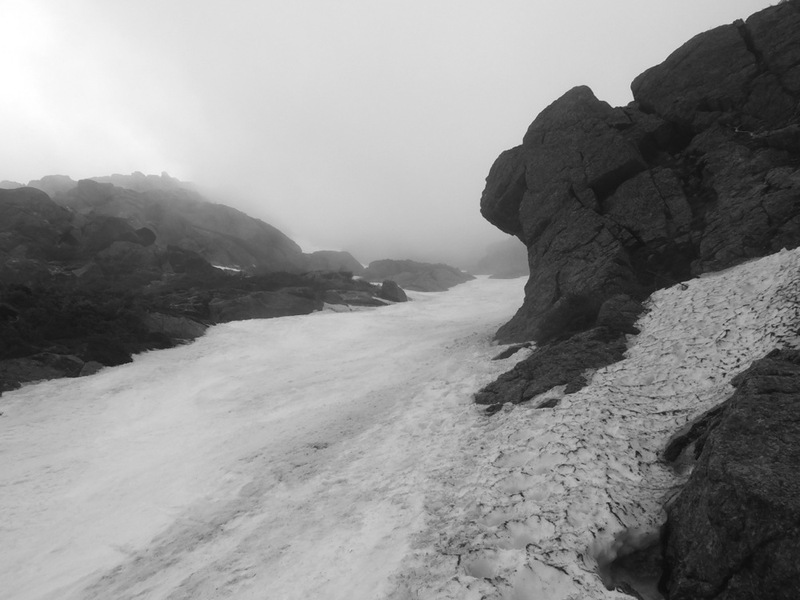 At last, I booted over the remains of a cornice atop the gully and reached the flat platform of snow at the top. I clicked into my bindings and began my descent back into the gulf. Airplane is steep but not puckering, with a sustained pitch of about 40 degrees. Rock walls line the upper part of the gully, which narrows to a minor choke point. From there the gully opens up and the pitch mellows out, leaving room for wide, swooping turns. The snow was soft and the turns were enjoyable, about as good as it gets for eastern skiing in May. 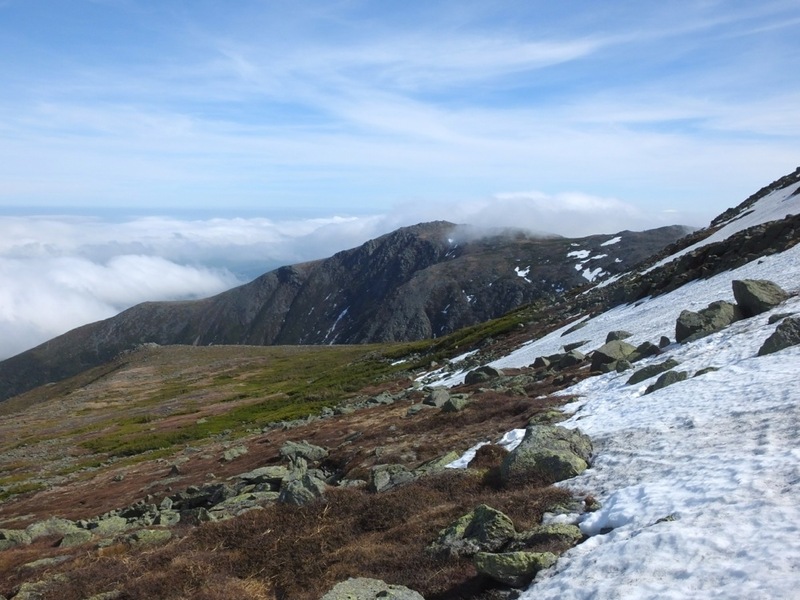 After another lap in Airplane, I hiked the Gulfside trail over to the summit of Mount Washington. By now the sun was out, exposing a spectacular panorama of the surrounding mountains. I meandered down the auto road to the eastern snowfields, which sported about 500 vertical feet of skiing in heavy slush, baked by the May sun. After two laps in the snowfields, it was time to begin the slog back to my campsite. I opted for a different descent route, across the high plateau on the Alpine Garden trail. From here I took the Nelson Crag trail down to the auto road, walked the road for about a mile, and turned onto the Chandler Brook trail, which led back down to the bottom of the gulf. This proved to be a much more reasonable route, almost entirely devoid of snow and ice. That night, after a grueling 14-hour day, I slept very well. After my punishing slog up the valley, I opted to hike back out to the parking area and take the auto road up, for day two. Snow conditions in Airplane were similar to the previous day, although the gully sported nice soft bumps created by the constant stream of skier traffic. 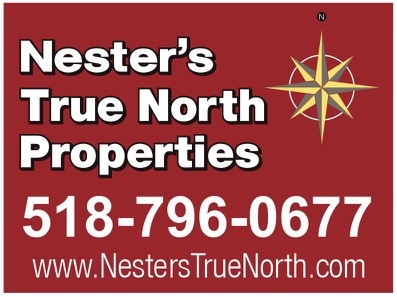 The day was perfectly sunny with warm temperatures, allowing for comfortable skiing in shorts and a tee-shirt. After several laps I once again headed over to the snowfields, where I finished up my ski season with two quick laps in the slush. 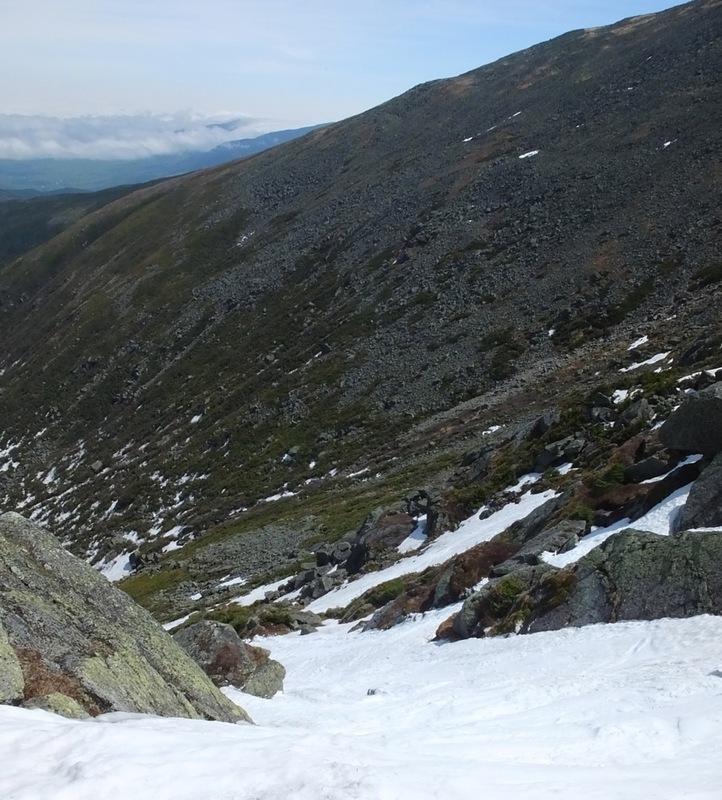 Mount Washington is a great place for late-season skiing, one of our few alpine playgrounds here in the northeast. Whether for skiing, climbing, or hiking, I cannot wait to go back and explore more of the aspects that make it such a special place. Very nice, JJ! Thanks for recounting your adventure. Love the swooping turns. We were just up in the snow fields in mid-April doing some fun swoopings ourselves. Your camp and hike up sound pretty scary though. …dangerous. No wonder you slept so well, sounds like a super long day, good for you! Way to go, hiking-in, even with the road open right next door. Real imagination and hard work must have led to an experience that surpassed your expectations no matter the snow conditions. Well played. Great pictures JJ. That final shot makes me gives me that feeling for sure. Seems like you had a primo season.